So, yesterday, I totally had one of those panic realizations that Halloween is this month. How did I forget something like that!? This year has been going by so quickly, I can't seem to keep up with the time! Before we know it, there will be snow on the ground! Although, I must admit, I am pretty excited to decorate our new place for Christmas. Yes, I am weird like that. I can't help it, I love Christmas lights! So, about these cookies. Aren't they just adorable? 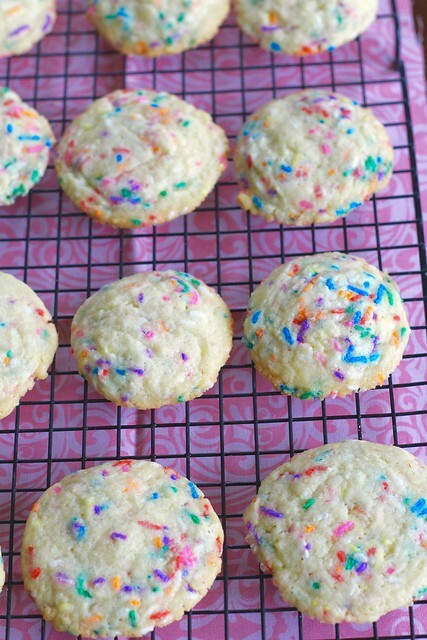 What is it about sprinkles that makes everything cuter? 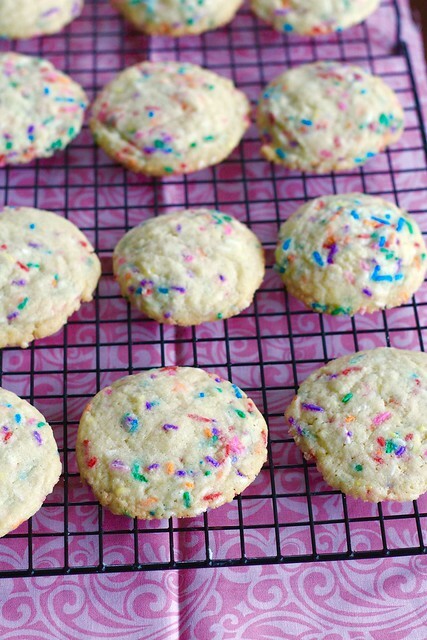 These sugar cookies are soft, chewy and just down-right delicious. The rainbow sprinkles could definitely be exchanged for some holiday themed sprinkles. Red, green and white for Christmas anyone? Preheat the oven to 350ºF. Line baking sheets with parchment paper or silicone baking mats. In a small bowl, whisk together the flour, baking powder and salt. In the bowl of an electric mixer, cream together the butter and sugars on medium-high speed, until light and fluffy, 2-3 minutes. Stir in the egg and vanilla. Mix in the dry ingredients with the on low speed just until incorporated. Fold in the sprinkles with a spatula. Scoop the dough into balls, about 2 tablespoons each. Space them evenly on the baking sheets about 2 inches apart. Bake, rotating the pans halfway through the baking time, until the cookies are just set and the edges are barely browned, about 15-16 minutes. Let cool briefly on the baking sheets, then transfer to a wire rack to cool completely.